We have replicated the metal versionWe have replicated the woodenand nowfor the first time in history, we are replicating the exact Zelda Sword in Foam version. Made for the standards of the LARP (live action role play) industries, this authentic replica foam Zelda sword can also be used for cosplay, conventions or just plain pretending. 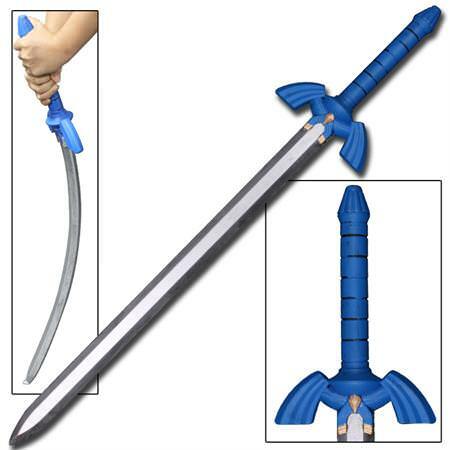 Constructed from high quality Polyurethane foam with an all one piece PVC inner core, this Zelda sword is fashioned to look and feel like the real deal. Hand painted and featuring intricate details from end to end, this sword is part of our Junior Warlords Collection of high quality foam padded weapons that are great costume and its made perfectly safe for children- awesome products for both the young and the young at heart! Best known for its role in Zelda: Ocarina of Time, the Master Sword allows Link to control the flow of time, traveling between the future and present. With this sword, you must travel to the Sacred Realm and banish the King of Evil, Ganon, into exile. Complete with the Triforce seal engraved on the blade (aka The Golden Power seal), this sword will impede evils ability to act.